Perseverance, where are you my Friend? Why do some people give up while others just keep on pushing through? 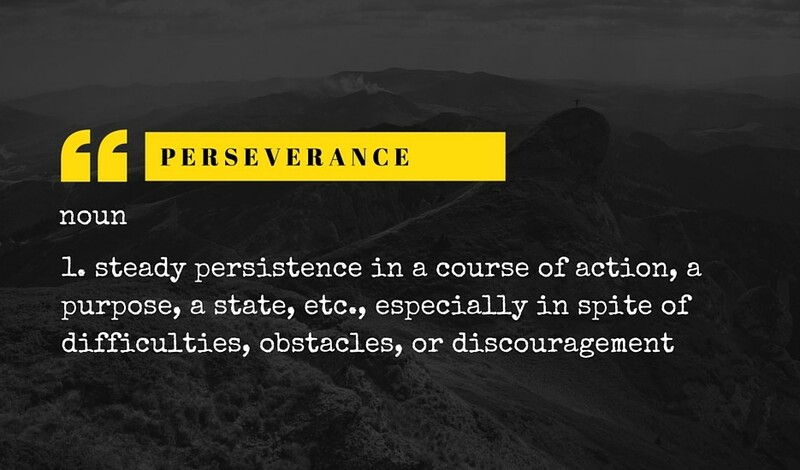 Is perseverance a learnt behaviour or is there an innate predisposition to it? I recently returned to yoga after a couple of years off. Yoga for me has always been more about the mental exercise rather than the physical exercise. I do hot yoga so as well as my body being stretched to its limit, I also have the heat to contend with and heat – I have learnt over the years – brings a whole other set of mental challenges. What I noticed over my first few weeks back was that I was very quick to give up on a posture once it hurt too much or was too uncomfortable. The mind chatter would start and totally let me off the hook: “Kato, you don’t want to hurt yourself, maybe you should just have a little sit down” or “Kato, your heart is beating particularly fast, I think you should rest for a minute”. The first month or so I gently eased myself back into yoga, not even considering for a moment that I could have been working much harder. I mean, I was just loving myself for finally getting back in the room. That was my “Get Out Of Jail Free” card: I was there so I don’t have to push myself too hard! It wasn’t until I was in a class being taught by the studio owner, Hannah, about five or six weeks in. Hannah is an old friend of mine and funnily enough we did our very first yoga class together back in 2008. Hannah is an excellent teacher and I noticed that as I participated in her class I dug deeper, tried harder, gritted my teeth through the pain more, and turned a corner. I left that class feeling amazing – I knew that I had given it everything I had and I was basking in the glow of tired muscles and a detoxed body. It was after this class that I really got thinking: “How come I was willing to work so much harder in today’s class? How come my perseverance really showed up today?”. I realised that I wanted to do my best for Hannah. I am externally motivated and because I care about her, I wanted to give it 100% to show her I appreciate her teaching. This bought up a new question: had the perseverance always been inside me or did I just develop it today? The intuitive answer that came to me is that it was always there – I just hadn’t tapped into it in a really long time. It had been dormant or I had totally ignored it. Yesterday I was talking with a friend of mine, Lee. She has just returned home from Mount Kilimanjaro and I was fascinated to hear about her trip and more specifically the walk up the mountain. I thought she would be able to offer more insight into perseverance. Lee’s journey sounded tough! It took five days to get up the mountain and on the fourth night, they slept for just a few hours before getting up at 2am and then hiking for 11 hours to the summit. She said it was so cold and her bones were aching with fatigue. It was minus 20 degrees at the peak so the exhilaration of getting there was heavily balanced with staying warm. I asked Lee what it took to get up that last section of the mountain and she looked me in the eye and said “Everything. It took everything.” and she smiled that wistful smile of a person who has conquered the world. She said: “I honestly didn’t think I was going to make it – it was literally a step-by-step process. Everything hurt and I was just so cold and tired. I used up every last resource I had in my body”. How easy would it have been to quit? Very!! Except she couldn’t quit: she had flown across an ocean to get there, taken time away from her family and friends, used leave time from work, spent the money, and gotten nine tenths up the mountain. She was therefore totally invested. And her perseverance showed up when she asked it to. I truly believe that we are capable of so much more than what we expect from ourselves. Maybe it’s our beliefs around not being good enough or the task being too hard. Maybe it’s us worrying about what people think or don’t think, and maybe for each of us the reasons are different, but I feel certain that perseverance lives happily and well within all of us. We just have to call on it more often.